Chester County Shotokan Karate Club has been teaching karate in Downingtown since 1981. We provide a family-focused environment, where kids and adults can learn respect and the value of commitment and hard work. We have Shotokan Karate classes 5 days a week, with 10 classes for beginner through black belt, kids and adults. All classes are lead by qualified instructors, most with 20 or more years of Shotokan training experience. Feel free to stop by the dojo to try a class or just watch. Any of our experienced instructors are happy to assist you. Email us anytime. We will respond within 24 hours. Traditional Japanese Karate in Downingtown, PA.
Our karate training consists of practicing Basics, Kata (forms), and Kumite (sparring). Basics comprises all the kicking, punching, striking and blocking movements of Shotokan Karate. 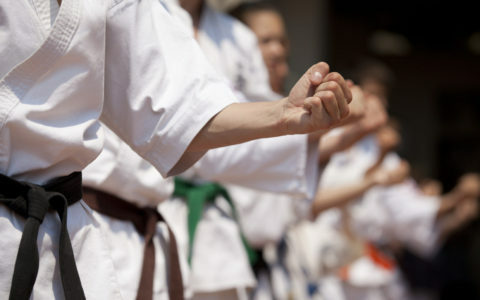 Kata combines the various moves in to a pre-defined group, which are performed in sequence against imaginary opponents. Kumite begins with partner drills of pre-arranged attacks and counter attacks and later moves on to free sparring using any of the techniques learned in Basics and Kata, all practiced in a controlled environment. Our chief instructor is well-respected throughout our interantional organization. He is an 8th degree black belt, and began his training in 1970 under Master Teruyuki Okazaki. Chester County Shotokan Karate Club has been teaching traditional Japanese karate in Downingtown, PA since 1981. Your first 2 classes are FREE! Plus, no hidden fees or contracts.